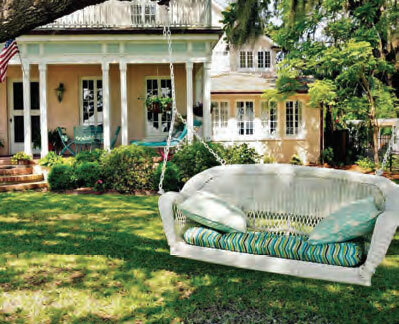 A stately 1920s house in the Bay St. Louis historic district fulfills a lifelong dream for a Hattiesburg couple. Maybe the pull most people feel for a coastline is a simple desire to be near water. To have an expansive view of sky and sea. To breathe deeply of salt-scented air. But for many who live farther inland in this particular state, there’s more. A historic sense of place also beckons with a different charm. For while coastal communities on the Gulf were colonized by European settlers more than 300 years ago, most of the cities in the interior — at least those away from the Mississippi River — are fledglings by comparison. For instance, Hattiesburg, our neighbor an hour away, wasn’t established until 1884. Back then, the new train lines and the burgeoning lumber trade tied the Coast to the young boomtown with economic and cultural apron strings. More than 130 years later, those ties still have Hattiesburg natives traveling southward on a regular basis. Many have second homes on the Coast during their working years. They dream of the day they’ll be able to retire by the water full time. Marvin and Regina “Gina” Morris followed in those footsteps. The couple were lifetime residents of Hattiesburg. Now, as they approach their seventh decade, evenings often find them sitting on the front porch of their Bay St. Louis home. 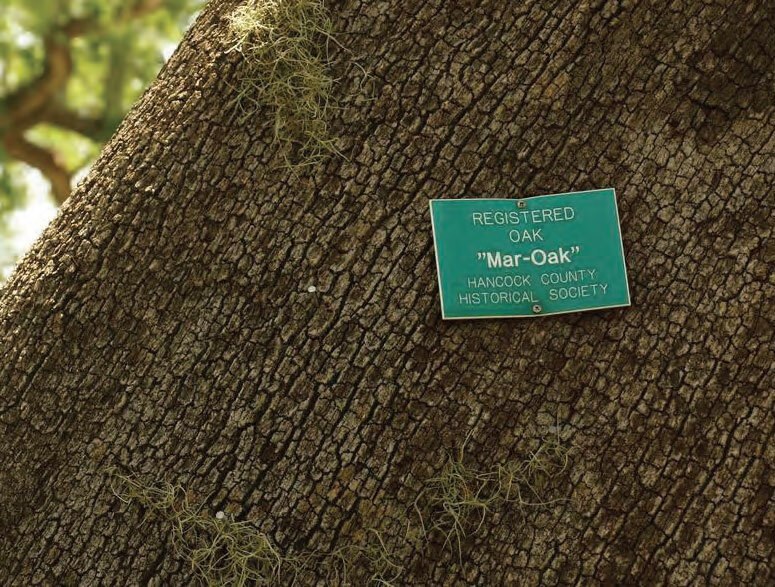 Watching the moon rise over the Sound, its light filtering through the boughs of the live oak tree, they sometimes consider the path that brought them to one of the loveliest historic houses on the Coast, the one at 600 North Beach Blvd. Marvin and Gina met in 1966 while they were both freshmen at Southern Mississippi. Marvin is a Hattiesburg native, while Gina had grown up in Sumrall, a rural community in Lamar County. Hattiesburg represented the big city to her. She and her girlfriends from college would cruise through the burger drive-thrus with Gina at the wheel of her parents’ 1963 station wagon. One evening, she and Marvin struck up a conversation. Neither looked back. They married in 1968. Gina graduated with a degree in accounting (“I like things that add up!”). Marvin planned to follow in his father’s real estate developer footsteps. He acquired a degree in a new major offered at Southern: finance, with concentrations in real estate and insurance. After graduation, he helped his father construct apartment complexes on the Coast, which gave the newlyweds plenty of opportunities to explore the area together. Skyrocketing interest rates in the mid-’70s had Marvin reconsidering his choice of career. The young father began law school at Mississippi College. Working the entire time, he graduated just two days before the couple’s third child was born. The Coast became even more important to the couple as a family getaway, nearby and economical. The young couple teamed up with other young families to share camps on the Coast, first in Vancleave and then in Shoreline Park. Idyllic memories of those carefree times — and promises of more — made the workaday world in Hattiesburg seem brighter. Busy careers and the activities of four children eventually cut into their time on the Coast, but the Morrises still dreamed and schemed to return. Finally, in 2002, the empty nesters bought a home on Henderson Point near Pass Christian, one that would be their retirement home. Dream fulfilled. But the dream home’s three bedrooms and two baths proved to be too small when all the children — and growing number of grandchildren — came calling. The couple began an ambitious addition that doubled the size of the house, allowing for full-tilt boogie family reunions. The Morris home in Hattiesburg also sustained tremendous damage, so for the next few years, they focused on getting their lives in order there. Yet the Coast still called. So when a cousin suggested that Marvin and Gina start looking in Bay St. Louis, they drove down and found a house for sale on Main Street. 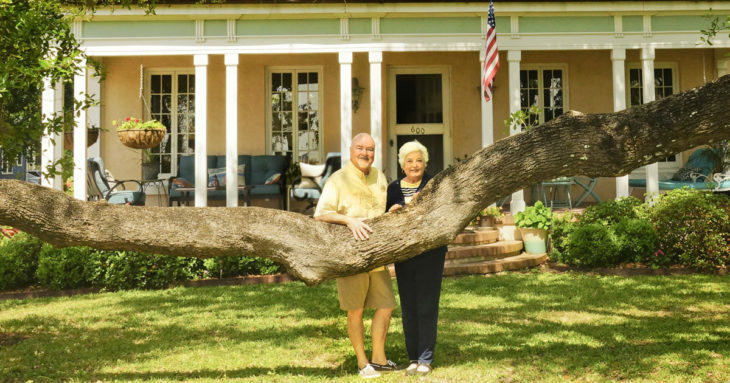 Built on some of the highest ground fronting the entire Gulf of Mexico, the Old Town historic district had taken a beating, but its core was still basically intact. One of the joys of living in Old Town is the walkability of the neighborhood. After Marvin had open-heart surgery in 2008, the couple’s pleasure walking included a therapy element. They marked off their favorite 1-mile route. Round trip, 2 miles. Their daily route ended right in front of a stately pink house facing the Mississippi Sound, one built in the 1920s. They’d always admired the house, so it made a pleasurable marker in their day. One Friday, they spotted a “for sale” sign in the front yard of their turnaround house. They called realtor Estus Kea, who had sold them the Main Street cottage. The Morrises arranged for a showing the next day and put in an offer the next. The couple bought the 2,800-square-foot house knowing that it would need both major renovations and a large addition. Since there was no downstairs bedroom, they wanted to build a master suite in the eventuality that neither could climb stairs. After many talks, Gina finally took out a yellow legal pad and began sketching the addition that would add another 1,600 square feet to the historic home. It would have modern conveniences and a contemporary feel, yet it would complement the original home. A draftsman drew up construction documents from Gina’s sketch. When a friend saw the design, she brought over a copy of the post-Katrina Summary Report, published by the Mississippi Renewal Forum. Some of the best architects and planners in the country had worked on the publication four years earlier. It put forth ideas for each of the Coast communities to consider while rebuilding. On page 23 of the book, in the section on Bay St. Louis, is a drawing of 600 North Beach. The house is unmistakable. The drawing shows an addition to the rear. The drawing is presented in the book as an example of how surviving historic homes could be enlarged. From the detail that can be seen, it looks almost identical to the one that Gina designed. Gina had instinctively nailed it. When the addition was completed, The Bay St. Louis Historic Preservation Commission recognized the addition with a 2010 People’s Choice Award for New Construction, a major pat on the back for improving the historic district and the city. In the addition, the lion’s share of the ground floor contains a master suite for Marvin and Gina. 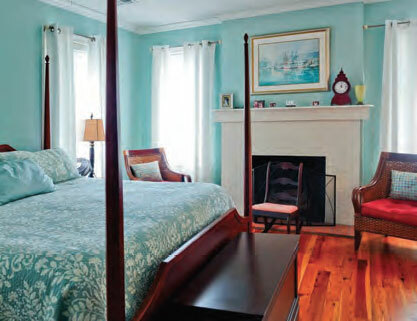 Upstairs are two spacious bedrooms adjoining a Jack & Jill bath. All of the bedrooms open onto wide screen porches overlooking the tropical landscaping in the back yard. It’s obvious that the couple finds gardening one of their joys in life. Their vision in landscaping is especially apparent when comparing the photo of the addition from 2010 and a current one, taken eight years later. Meanwhile, in the original house, the HVAC systems were replaced and the bathrooms remodeled. The house was painted (and is under the watchful eye of painting contractor Chris Hansen, who inspects each year for needed touch-ups that will prevent serious damage). Chris’ wife, building contractor Jackye Crane (Crane Builders), remodeled the kitchen and is credited with discovering and resolving a major structural issue. “We’d had other contractors look at the floor upstairs because it was getting bouncy. No one could find any reason for it,” Marvin says. “Jackye had the good sense to actually tear out some boards so she could see the damage. Termites had eaten everything under the sun between the floors.” Repairs were made, flooring replaced and it’s now impossible to differentiate between original and new. Most of the furnishings, artwork and décor tell stories. There’s a statue of Evangeline that Marvin’s parents purchased when they were young. There’s the door knocker from the house Marvin grew up in on Main Street in Hattiesburg. There’s the old oak table that came from Gina’s grandmother and her mother’s mirror. 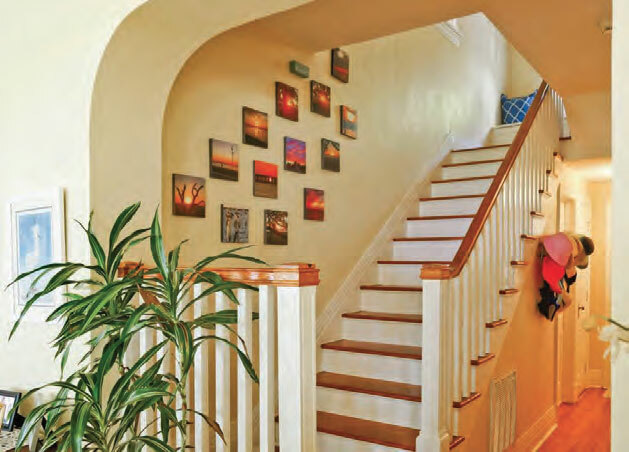 There are also stunning sunset and sunrise photographs sprinkled throughout the house. Marvin is a photography enthusiast and delights in capturing the local scenic beauty to share. The new/historic hybrid house is often filled with family. At full capacity, there are 18 adults and children and a dozen dogs. Next article Do you lose your place while reading?